1/10/2016 ** Beautifully poignant tale of love, loss, and appreciation for the person in our life every single day. 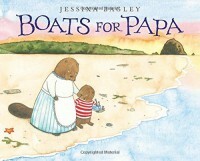 Caldecott contender? 1/9/2016 ** As I've read today, I've wondered about books that were moving, but seemed so far beyond the realm of my students' experiences that I wasn't sure if they'd be able to connect. I think children will be able to connect with this one, in unexpected ways. 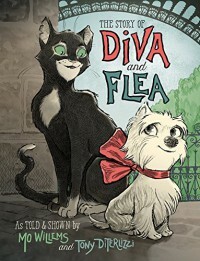 Diva lives a privileged life in a lovely, safe apartment; Flea wanders and is self-sufficient. Diva doesn't wonder where her next meal will come from, but is fearful of new things. Flea relishes new things, but doesn't know what it is to eat without looking over his shoulder for a swinging broom. Though the world of Paris and the language of French are unfamiliar to the majority of my students, and though the book has an antiquated look, the themes of friendship, courage, and the fear of the unknown will resonate with all readers. Through friendship, we learn new things. Through empathy and respect for others we can develop loyalty and face our fears. Find it, read it. It will touch your heart. 12/8/2015 ** Wow! Just wow. 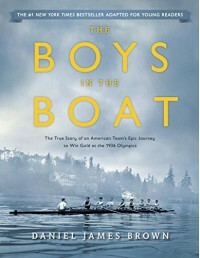 If Steve Sheinkin wrote it, you should read it. Even if you've never heard of the issue or topic, even if you think you won't be interested. 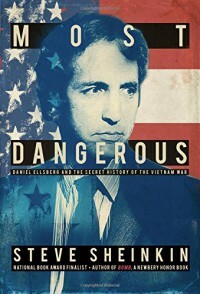 I'd never heard of Daniel Ellsberg, the subject of this biography; I thought his story might be rather dry. However, Sheinkin skillfully conveys the intense historical drama and spy-thriller like aspects of Ellsberg's quest to leak of the Pentagon Papers - a 7000 page top secret report which outlined the pervasive pattern of lies and corruption behind 4 presidential administrations' decisions to get into and stay involved in the Vietnam War. Ellsberg's decision to leak these documents, despite the risk of being tried under the Espionage Act, was influenced by his belief that some governmental secrets shouldn't be kept from the people of a democracy. The epilogue highlights the continuing importance of these questions in light of the Snowdon leaks about recent governmental programs of surveillance of Americans. 10/18/15 ** Thank you to Scholastic for sending FREE copies of the finished book (not an ARC) to everyone who attended NErD Camp-Michigan. Sunny is unexpectedly sent to spend a month of her summer vacation with her grandfather in Florida. At first she's bored - no other kids in the retirement community her grandfather lives in. Then she finds a friend and they embark on adventures involving an alligator, comic books, and cat location. However, Sunny is keeping a secret. 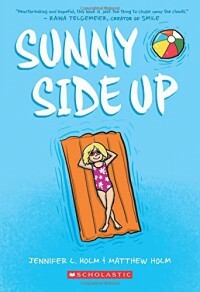 Through flashbacks, the reader begins to see the events that led to the cancellation of the family vacation and Sunny's relocation to Florida. Students unaccustomed to graphic novels may need support to attend to the changing dates/locations. I found myself flipping back to previous chapters several times to orient myself in the timeline. Likewise, reading mentors (teachers/parents) should be aware that the big secret is that Sunny's teen-aged brother is struggling with substance abuse. This book is semi-autobiographical and the Holms want young readers to be aware that there are many places they can reach out for help if a loved one is struggling with abuse; they don't need to keep secrets. A valuable addition to any classroom or library collection. 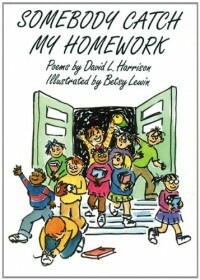 10/9/15 ** A hysterical series of poems about the tribulations of school. The voice (and deliberate use of non-conventional English) enhance the poems' humor. After enjoying the poems for their own sake, they could provide a valuable springboard for discussing the "rules" of language and when/why authors might choose to "break" those rules. "My Excuse" and "Ralphy" could be especially good for drawing students' attention to irregular verbs. "My Advice" could be used as an example of idioms ("eat a horse"). 10/9/15 ** A delightful series of poems about water in all it's many forms: sprinklers, ice, steam, the water cycle, popsicles, sprinklers, ponds, brooks, etc. The word play, rhymes, and rhythms are compelling in their own right. 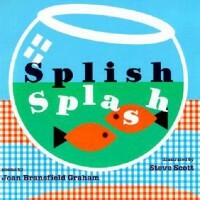 The book would also be an interesting addition to an elementary class's study of the water cycle or states of matter. The third poem, "Ocean," would also serve well as a short text on inferences - figuring out where the narrator is and using the pictures and textual cues to support one's assertion. 10/5/2015 ** An absolutely beautiful middle grade story about a girl who wants to play Charlotte in the class play - but isn't allowed to audition for the part. This is a book in which we can all find ourselves. There is a best friend who accepts George for who she is; there's a class bully who taunts and fights George for acting differently than he believes she should; there's the class queen who attempts to sway others' opinions. 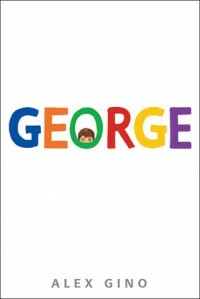 Oh, and the reason George isn't allowed to audition - she's in a boy's body. This is story about a fourth grader who happens to be transgender. It's lovingly told and highly empathetic. While this is a book about an important issue, it is also a beautiful middle grade novel for all children. 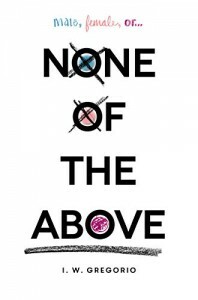 10/2/15 ** An absolutely fascinating book, with so many important ideas. The book is a series of journal entries written in verse during Gabi's senior year. 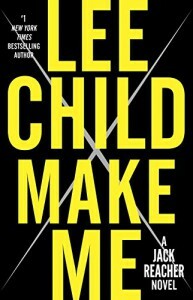 She explores her father's meth addiction, the coming out of a good friend, another friend's pregnancy, and her wishes about her boyfriend. Throughout the book she also strives to reconcile her notions of being a young American woman with her mother's ideas of how young Latina women should behave. 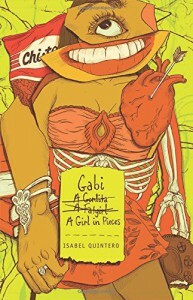 Gabi's snark and humor made me laugh and cry; her use of Spanish pushed my own ability to "read between the lines," and I felt as if I had made a new friend. 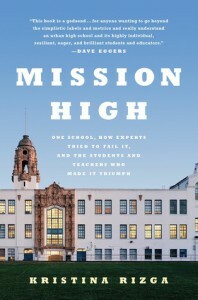 9/24/2015 ** Given the buzz I've heard from educators I respect about this book, I expected to feel a punch in the gut. I thoroughly respect the message, but I wasn't especially struck by lyrical prose. At first glance, I felt this was simply an homage to teachers, and that the primary audience would be teachers. However, I think many kids would connect with the feelings of alienation conveyed by the protagonist. Though not all kids struggle with reading, many feel that they don't fit it - because they don't do sports, or feel geeky, or don't have the right clothes. 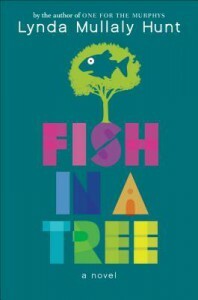 As a read-aloud, this book could be the flint that sparks important conversations about kindness, acceptance, and celebrating everyone's ability to think outside society's boxes. Read-alike books might by Out of My Mind by Sharon Draper or Wonder by R.J. Palacio. 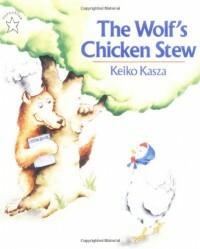 Delightfully told - Wolf realizes that the chicken and her chicks make better friends than dinner. A timeless story of giving for selfish reasons, but realizing that the giving can bring unsuspected joy. Just the write balance of predictability - through repetition and illustrations - with challenging words. Perfect for early independent readers. 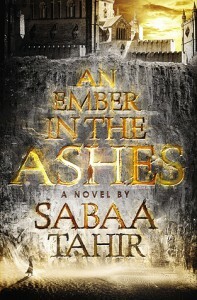 Excellent world building and even better characterization. Written in alternating voices - Elias and Laia. Though the chapters are headed by the characters' names, they don't need to be. The voices are distinct and the plot events unique to the individuals. Because the book is written with both characters' voices, I felt that I got to know each of them as individuals. As I read, I did want to know more about several supporting characters. Surely the Commandant couldn't be as cold and evil as she seemed? Her back story is hinted at late in the book. Perhaps we will see more nuance in her personality in future volumes. Where the power of Red Queen (Aveyard) is in the issues raised in the sociopolitical context of the people's powers, the power of this book lies in the compelling emotions of the characters. Laia constantly compares herself to her now-dead parents, feeling herself lacking. Instead, as the story progresses, she begins to understand her own personality, while different, is also strong. 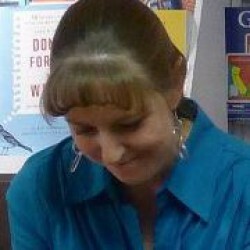 Early in the book, she puts her own survival above that of others, taking the gifts they offer; later she recognizes her power to help others, surprising many along the way. I eagerly await the sequel in April.